Home review only, I have not gigged this yet. First, someone commented that the case is quite flimsy... well when there is nothing in it, it's obviously not the strongest of devices. I wouldn't say it's weak though. When there are a few devices racked, it holds up fine to the point that sometimes I sit on it when playing. Probably not the best thing to do but it hardly flexes so I feel OK doing it. It holds all of these devices fine, the width is perfect and the depth is more than adequate. There is plenty of room behind my e840. The doors affix nicely to the body via four rotating butterfly catches, they have holes in so look like they can be locked..... not tried it. One of the doors has netting on it with a zip so you can keep any extra cables or bits and pieces secure while travelling. The branding is not intrusive, just a Thomann name moulded into the doors. I'm a fan of not having huge MESA/BOOGIE - PEAVEY - MARSHALL stickers on anything so this is a plus for me. The top and bottom are mirrored, I assume so that you can stack these things if you have a ton of equipment. Empty, the case is very lightweight while still feeling like it provides adequate protection when devices are racked. Oh, i nearly forgot... It's also the cheapest one that I could find ANYWHERE. If it was badly made, I would have marked it down, but it's not badly made, it's just a budget item! For the price, it's amazing. I can see myself using this for a long time to come. Great for the price, but not the best available. I am using this rack to transport the power amps and cross-overs etc. for the band's PA system. The reason for choosing this case was the price, but there are some issues due to the budget-build of the product. The main issue is the handles, they do not leave enough space to comfortably get your hand around. The doors can be a bit tricky to fit compared to more expensive cases. Finally, due to the weight of the power amps that this case carries, it could do with wheels. Having used this case taking it to gigs for over a year now, I feel that for the price I paid I am willing to live with the issues the case has. I use a skid with castors to move it around venues and the doors are still working after a year of use. 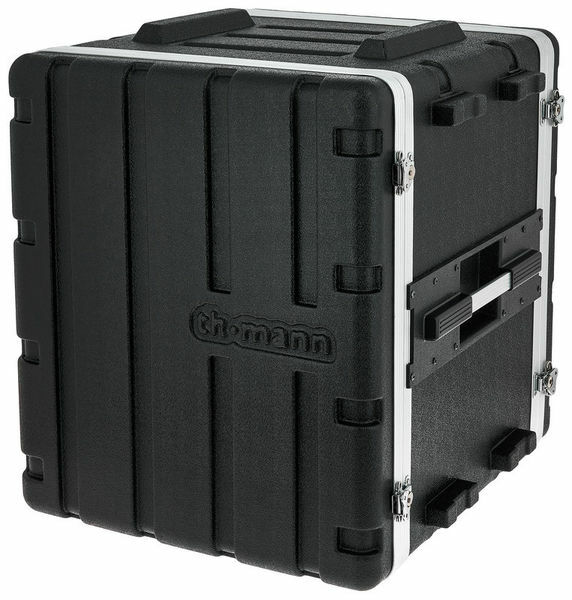 With everything said, we must consider the price, and for the money you get a decent quality case that keeps your equipment safe which is all you need at the end of the day. If you need something that is easier to carry and has wheels, be prepared to pay a lot more! ps. This case includes screws for fixing your rack units to it. ID: 241140 © 1996–2019 Thomann GmbH Thomann loves you, because you rock!